Kinkaku-ji doesn’t allow visitors inside the temple, but a stroll of the grounds will give you new understanding of life. 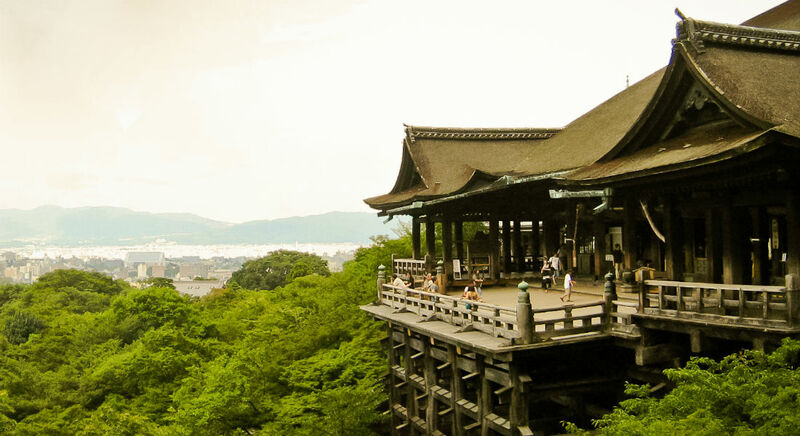 Rising high into the Kyoto sky, the Temple of the Golden Pavilion is an innovation in design. Three stories tall, each floor incorporates a different architectural influence: the ground floor, The Chamber of Dharma Waters, is designed in Shinden themes, white plaster and wood beams, to help the structure blend harmoniously with the exquisite strolling garden. The second floor, The Tower of Sound Waves, harkens back to the historic castles of Ancient Japan with its buke-zukuri themes, while the third floor, The Cupola of the Ultimate, inspires feelings of the Chinese Zen style. The namesake of the temple is instantly apparent, as its upper two stories are completely gilded in gold leaf and crowned with a golden phoenix. When the orange rays of the setting sun catch the temple and send its reflection blazing across the Kyoko-chi, the Mirror Pond, you’ll understand why this temple holds so many national honors. The tranquility of the shakkei-style strolling garden, designed to blend seamlessly with the natural landscape, will soothe your spirit as you walk pathways that replicate locations made famous in East Asian literature and toss coins at statues to bring you luck in life, and sipping a hot cup of matcha in the teagarden will show you the meaning of serenity. 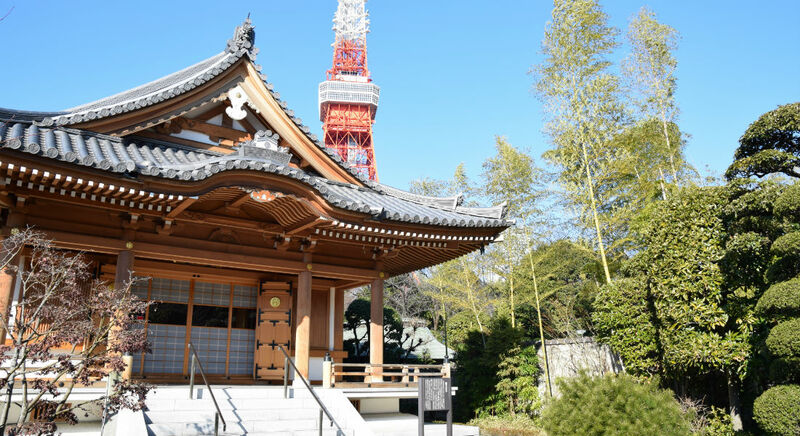 To visit the Zojo-ji Temple of Tokyo is to understand resilience. The temple’s main gate, known as the Sangadetsumon, is Tokyo’s oldest wooden building, and has withstood fires, earthquakes and wars. It’s the only part of the temple that remained standing, unflinching and undamaged, through WWII. Few of Japan’s ancient spiritual buildings, often built of wood, can boast the same claim. The name of the gate is a reference to the number three and to Moksha, the Buddhist ideas of liberation and release. It’s said that walking through the massive vermilion gate will relieve you of your burdens of greed, hatred and foolishness. Perhaps its strength comes from the spirits of the six Tokugawa shoguns–heads of military government who ruled from the 17th to 19th centuries–entombed in its mausoleum, or perhaps it was only a temple of such strength that could have ever become the final resting place of such powerful warriors. While you’re admiring the Treasure Gallery and the Repository, or taking in any of the annual celebrations held at the festival, take a moment to pay your respects to resilience of a different form: the Sentai Kosodate Jizo–the Garden of Unborn Children. Hundreds of small statues are lined here, representations of the god Jizo who protects the souls of children who didn’t survive birth. The statues wear small clothes in bright, happy colors and red knitted caps as bereaved parents honor their lost children and leave toys as offerings to the kind-faced god who will see their children’s spirits safely through the afterlife. The approach to Kiyomizu-dera is like stepping into the past. The Higashiyama District is the best preserved historic district in all of Kyoto, full of shops, restaurants and Japanese-style inns known as ryokan that have stood for centuries to cater to the needs of pilgrims journeying to the temple and retained their traditional exteriors. A trek through the steeply sloping streets of the district will bring you to the beautiful temple known as the Pure Water Temple, named in reference to the Otowa waterfall that runs right through it. The waterfall is diverted into three streams which fall into a pond, and visitors are encouraged to reach out a cup and capture some of the water to drink. Each stream is said to bestow different gifts: longevity and good health, good fortune in studies and schooling, or luck in love and marriage, but choose carefully because drinking from all three is considered greedy. In the Jishu Shrine to Okuninushi, the god of love and matchmaking, a pair of “love stones” are set 60 feet apart from each other, and visitors desiring true love are encouraged to attempt a walk from one stone to the other while blindfolded. Successfully making the trip will guarantee you find true love in life, but if you require an assistant to help you navigate, it’s said you’ll need a matchmaker to meet them. The main hall was constructed in 1633 by toryo, master carpenters who perfected the art of constructing buildings without the use of nails or glue, and its wide verandas and sweeping stage are held at a lofty 42 feet in the air, overlooking the forest of trees surrounding the temple. In the spring when the candy-pink cherry trees are in full bloom, or the autumn when the maples are alight with red and orange leaves like an ocean of flame, and the city of Kyoto is visible in the distance, you’ll experience a taste of Ancient Japan in the 21st century. During the 8th century, Japan was being ravaged by earthquakes and floods, and the population decimated by epidemic. So, Emperor Shomu called for his people to become directly involved with the construction of local temples and shrines, believing a reemergence of piety would lead the Buddha to protect them from further devastation. 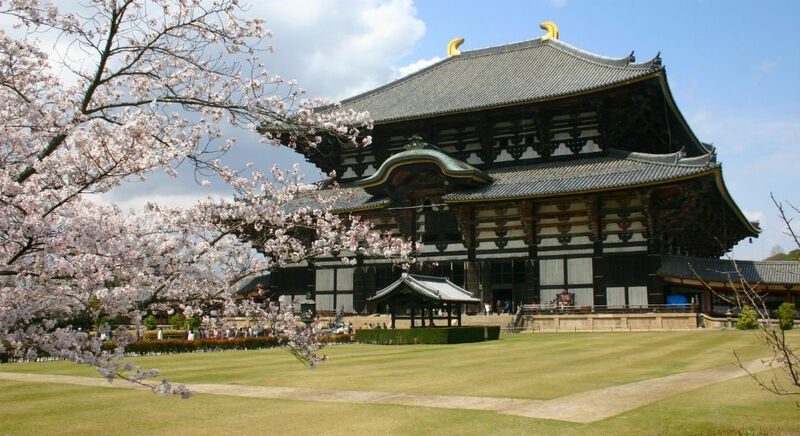 Whether by coincidence or divine means, Japan’s misfortunes turned around, and the Eastern Great Temple Todai-ji stands today as one of the Seven Great Temples of Nara. As with many of Japan’s worship sites, Todai-ji was badly damaged during WWII and though it was rebuilt and restored, it stands only two-thirds its former size. Despite this, it’s still the largest wooden building on Earth! With its towering main hall of white plaster and wooden beams, its sloping roofs and wide, curving eaves, could there be a more iconic, picturesque location in all of Nara? Perhaps there is, but none of them contain the treasure Todai-ji holds in its Daibutsuden: the most massive bronze sculpture of the Buddha Vairocana in all the world. Weighing in at an epic 500 tons and nearly 50 feet tall seated, the construction of the statue nearly bankrupted the country in 752 AD, depleting all the bronze deposits that could be mined. The Buddha’s upraised hand alone is as tall as a human, and its nostrils are large enough a person could pass through them. In fact, a supporting beam in the Great Buddha Hall has in it a hole of the same dimensions as the Buddha’s nostril, and it’s said that to pass through this hole now will grant the passer enlightenment in their next life. A visit to Kasuga Grand Shrine in Nara brings with it all the enchantment of stepping right into a Hayao Miyazaki film.The pathway through Deer Park is lined with thousands of stone lanterns to guide your way, a breathtaking sight to behold when each lantern is lit during festivals in February and August, and hundreds of wild Sika deer roam the forest and temple grounds. It’s believed that over a thousand years ago, Takemikazuchi, a god of swords and thunder and the protector of Nara, rode into the city on the back of a white deer, and the Sika deer are messengers he sends to watch over the city and its occupants, returning to him if Nara falls under threat. As such, the deer are registered National Treasures of Japan, and delight in approaching visitors in hopes of receiving shika senbei, special crackers sold for feeding the deer. The main shrine of the temple enshrines Takemikazuchi, with a dozen other shrines arranged around the grounds. This includes shrines to the lucky gods, the Wakamiya Shrine to Kogami where dance festivals are held, and the Meoto Daikokusha Shrine, dedicated to married deities, where a visit to this shrine is said to bring great fortune in love and marriage. The temple itself is strung with ornate bronze lanterns, many of which have been donated by worshipers, and is adjacent to Kasuga Taisha Shinen Manyo Botanical Gardens, where over 250 plants described in the Manyoshu, Japan’s oldest collection of poems dating back to the 8th century, are nurtured. A ban on hunting and logging in the area since the 9th century means the view of the beautiful, lush forests surrounding the shrine has been virtually unchanged for over a thousand years, and during the spring the air is thick with the scent of long ropes of bursting wisteria that hang from high overhead to touch the ground. All the while, the sacred hill of Kasugayama and the primeval forest where gods dwell look on. The peaceful religions of Japan are a pristine reflection of the Japanese culture itself. 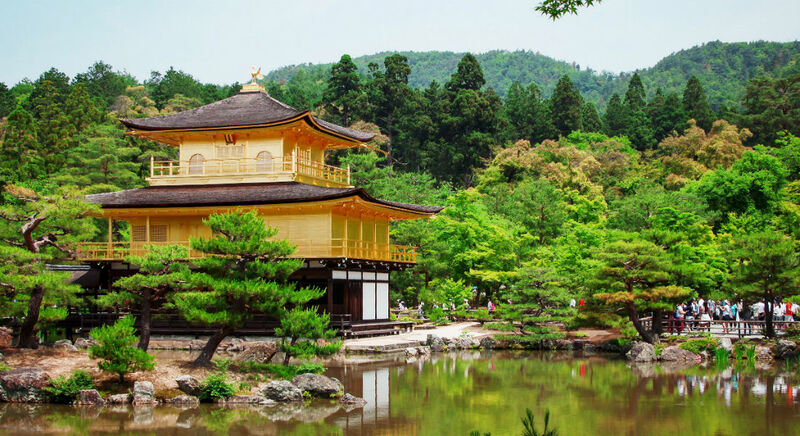 Whether you’re sipping tea in a garden shaded by a gilded temple, having your future divined in a busy market, or offering a treat to a real-life messenger of the gods, a visit to Japan’s beautiful temples and shrines will capture your heart and sate that spiritual wanderlust in ways no other trip could replicate. This blog was written in partnership with Japan National Tourism Organization (JNTO).